AI is a hot topic in the manufacturing industry. Sometimes referred to as machine intelligence, artificial intelligence is not only significantly saving time during the manufacturing process, it’s also improving product quality and employee safety. Algorithms are now being used to predict mechanical asset malfunctions and robots that were once executing repetitive tasks are now making cognitive-like decisions based on available data. So it comes to no surprise that the usage of AI in manufacturing also extends beyond the shop floor to the Marketing department. And this presents industrial sector businesses with a number of growth and service opportunities. Here we elaborate on a few ways manufacturers can use artificial intelligence to bring in more leads and customers—and keep them happy in 2019. The presence of chatbots across social platforms and websites is growing—and for good reason. Depending on the tool you use, marketing and sales personnel can program them to carry on full conversations with leads and customers without having to lift a human finger. Plus, bots make it easy to add a special and memorable touch to the beginning of your company's sales process. For example, our PMG-bot provides a streamlined way for us to collect contact information, answer general questions about our website content, and even book a meeting with an engaged website visitor. Once the visitor is ready to talk to a real person, our human PMG team member receives the notification to continue the process. But chatbots don’t have to be used just for the lead generation; you can also use them to service current clients, subscribers, and even employees. Here’s a list of various chatbot tools that you can use to get started. 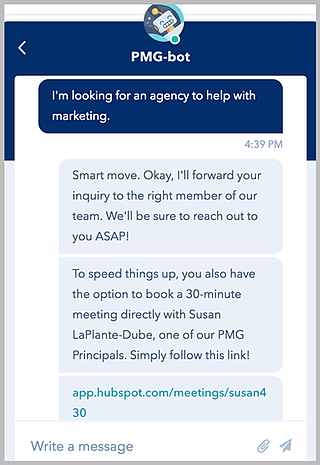 Note: our chatbot happens to be powered by HubSpot. Make your product accessible to buy through voice: If your product is sold at a large retailer like Walgreens, Target or Amazon, people can add it to their shopping list directly from their voice-activated assistant. Make your solution easy to learn about: If someone asks their assistant about a problem you solve, you want to be the one to answer that question. Make sure you optimize your content accordingly so that these tools can quickly pull the information from your site. 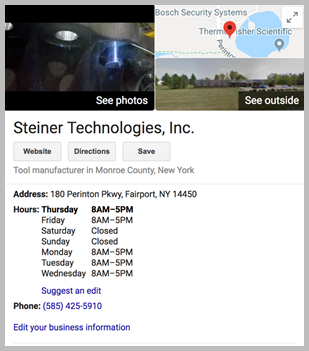 Share your location and business hours: Ensure that your Google business listing is correctly filled out. The assistants use these listings to gather information about your business when asked about your operating hours and location. They even let the user know how long it will take to get to your business based on their current location. If your business made it to 2019, you probably have most, if not all, of your customer data stored in a digital format (ie: in a CRM or Customer Relationship Management system). This is an advantage because you can now integrate that information with AI-powered tools to improve your marketing and customer success strategies. 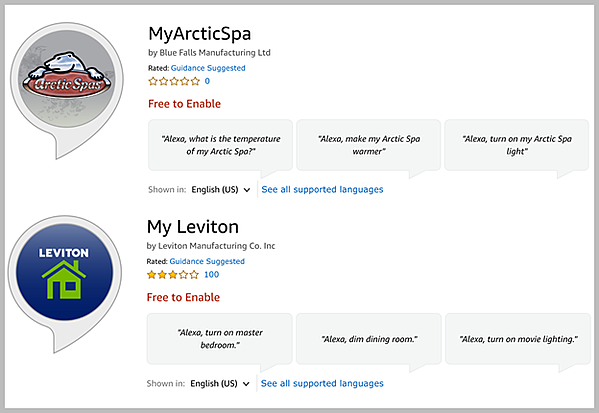 Tools like Rapid Miner, Birst, Perceptive AI, and Sisense use predictive analysis and analytics to give you insight into what’s going well and what’s not going well with your customer acquisition and retention strategy. They tout being able to detect early signs of churn, pinpoint the right time to upsell, and more. You can now take the guess work out of creating content that will grab the attention of your ideal buyers. Tools like Atomic Reach, MarketMuse, Acrolinx, and BrightEdge are using AI to help you get the data-driven actionable insights you need to produce content that becomes more and more relevant with each iteration. 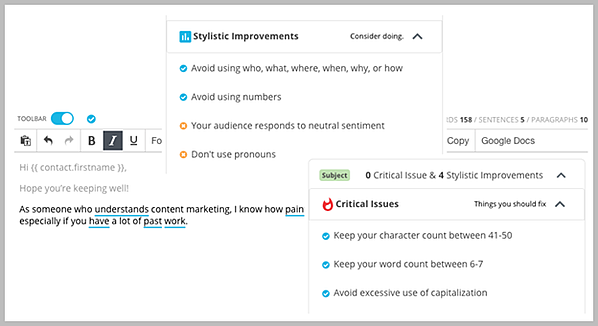 These tools cover everything from content strategy planning to SEO and ad copy improvement—and they touch on readability, content structure, emotional resonance, title optimization, and topics. As you can see, the presence of AI will soon become completely normalized in all aspects of our lives, both at work and at home. In the spirit of the new year, I challenge you to get started with at least one AI tool in 2019! Start saving time and resources while you improve your business with data-driven decisions. And if you need some help, feel free to reach out to us on our site. 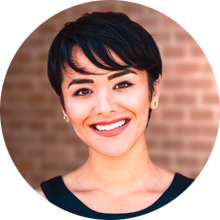 Sheila Villalobos is a PMG Account Manager and trend tracking extraordinaire. When she’s not being her naturally resourceful self and figuring out new ways to use old marketing tools, you can find her staying up to date on all things web design, ABM, contextual marketing and strategy (and writing blogs about them).